Travelling between Pietermaritzburg and the Drakensberg Mountains, you’ll find the Midlands Meander. A tourist route popular for the relaxed atmosphere, picturesque countryside and welcoming people. Here you will experience a variety of stunning nature, adventure activities, South African history, local crafts and delectable country-style food spots. At the heart of the Natal Midlands, between Nottingham Road and Lidgetton you’ll find the area of Balgowan, home to the new AfriCamps at Gowan Valley on Gowan Valley Guest Farm, opening July 2019. Keep an eye on our website and social media as we will be opening bookings in the coming weeks! 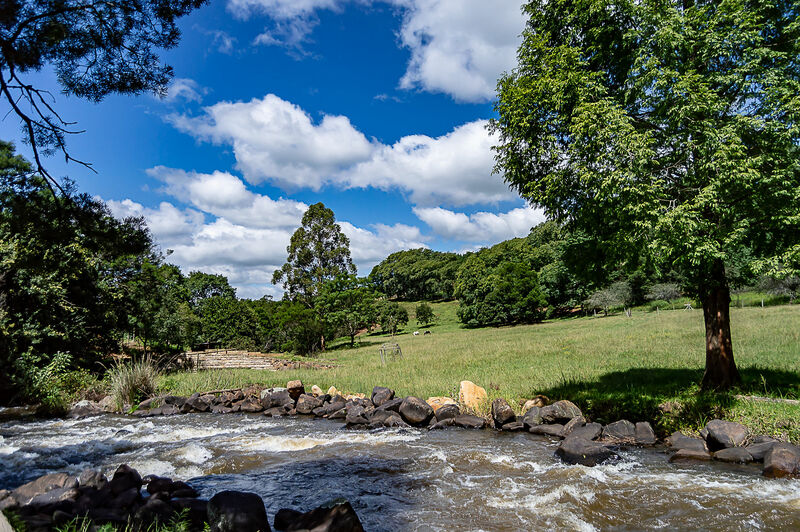 Balgowan is a farming area, well-loved for cycling and fishing in the many dams and streams. The area can see all four seasons in one day and you can expect some snow in surrounding areas during winter. The Midlands caters for a wide audience from foodies to adrenaline junkies, to serenity seekers – all in the beautiful and mystical surroundings. 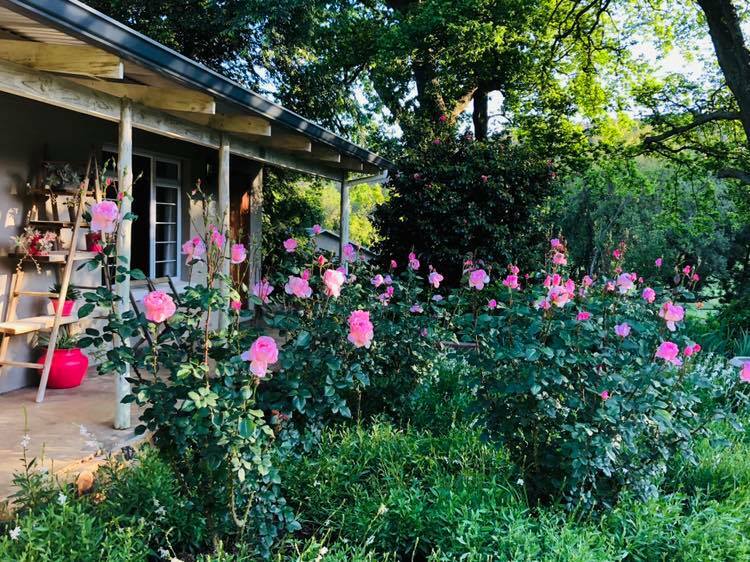 Many guests have had the pleasure of staying at the picturesque Gowan Valley Guest Farm in their beautifully decorated guest rooms which have been extensively renovated and redecorated over recent years. The property and its owners, Deanne and Brett Bouwer, have earned a stellar reputation based on previous guest experiences. 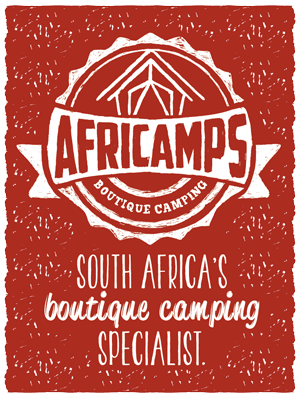 The Bouwers were first introduced to the AfriCamps concept in August 2018 during a family visit to Oakhurst farm in Wilderness. Their close friends, Jake and Claire Crowther, AfriCamps at Oakhurst’s camp owners, showed the Bouwers the site where AfriCamps at Oakhurst was in construction. The Bouwers were already looking for an alternative new accommodation offering to add to their property and AfriCamps fit the bill. 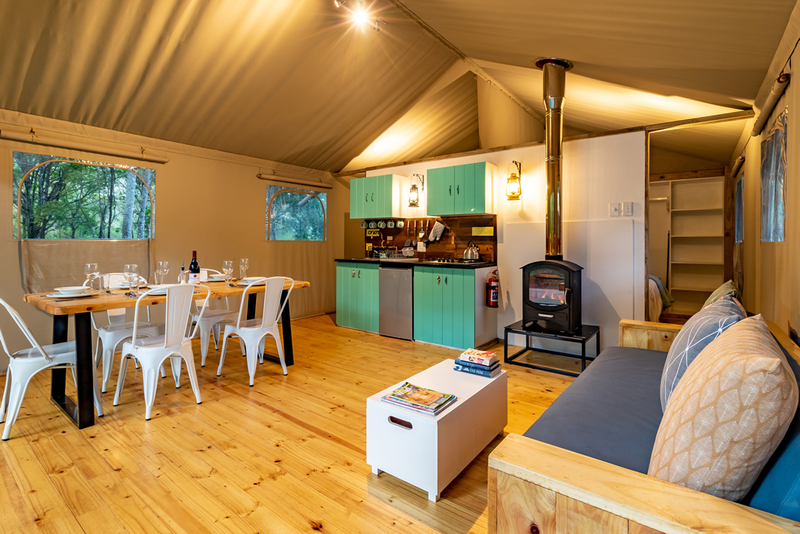 In 2019, Brett and Deanne joined the AfriCamps team and we couldn’t be happier to branch out to the captivating Natal Midlands with 5 brand new AfriCamps glamping tents. The inside of an AfriCamps luxury canvas tent sleeping up to 5 people. 5 tents will be opening on Gowan Valley Guest Farm in July 2019. The farm is truly enchanting with its rolling green hills and fields. Walking through the beautiful gardens dotted with roses, you are suddenly transported to the English countryside. Then the “moos“ of Nguni cattle bring you back to the Natal farm landscape. The Bouwers farm Nguni Cattle and Golden Kiwis. They also focus on their hospitality offerings which include 13 beautifully decorated guest rooms and catering for small functions – think Christmas parties and family gatherings. The property is graced by the crystal clear Mpofana river which flows strongly through the farm. As part of a water scheme, the river also provides water to the farm. A hollowed-out section in the river is a great spot to go for a dip or enjoy the river from the banks by settling down for a picnic. Try your luck and catch yellowtail or trout – strictly catch and release. pass the river, the newly planted kiwi fields and Nguni cattle. Take a strolls through the gorgeous rose gardens on the farm and settle down at a grassy picnic spot. Weddings: AfriCamps at Gowan Valley is conveniently located for guests visiting a range of popular wedding venues. 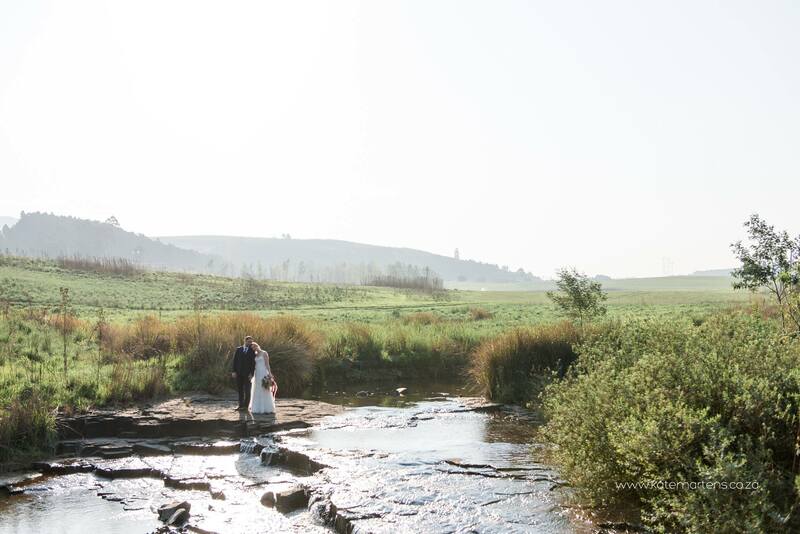 Only 2km away you’ll find the lovely Ochards Wedding Venue, also owned by the Bouwer family. A 5km drive takes you to The Glades and Zunguness wedding venues. St Ives is 10km away. 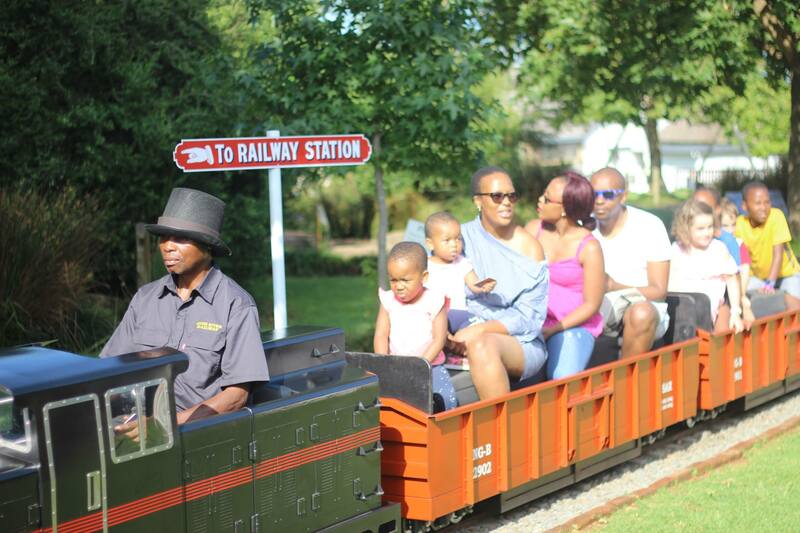 Schools: AfriCamps at Gowan Valley also makes the perfect family get-together for parents and kids from the nearby Michaelhouse Boys School, Clifton Prep School and Hilton College and St Anne’s DSG in Hilton. Join us during the next school derby and make a family affair of it. Events: Many popular events bring visitors to the greater Midlands area. Combine your stay with the annual Midmar Mile that takes place at the Midmar Dam. Be inspired at KZN’s premier Arts Festival or the Hilton Arts Festival at Hilton College. Support your loved ones during popular sporting events like Sani2C or Joburg2C, Durban’s Ironman or the Comrades Marathon (especially during a ‘down run’ from Pietermaritzburg to Durban). Golfing: With two world-class golf courses around the corner, make a golfing glamping tour of it! Take a swing at Gowrie Farm, only 11km away. This course is known as one of the top 30 most fun courses in the country (and we are serious advocates for fun). 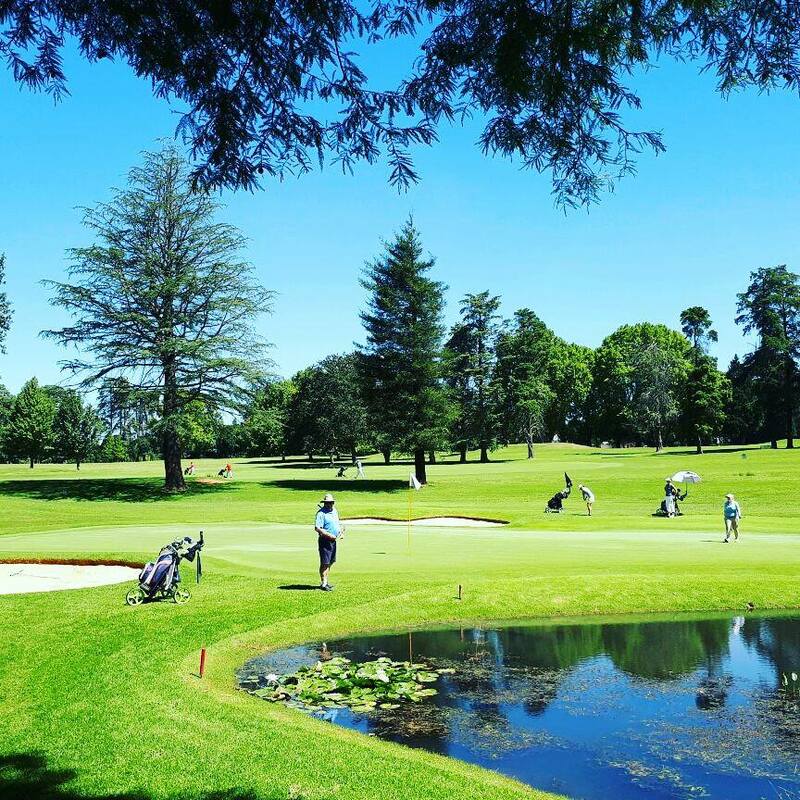 Bosch Hoek (10km away) is a beautiful country course with loads of charm and becomes a beautiful display of colour in Autumn. The cosy club house with its fireplace is particularly inviting after a round of golf during winter. Howick Falls (23km): The nearby area of Howick is waterfall country. Explore one or all three of the trails at Howick Falls to capture the perfect photo. At Howick Falls, also known as KwaNogqaza which means ‘place of the tall one’, the uMngeni river plummets 95m into a gushing pool. You can hike to the foot of this waterfall via the official Howick Falls Gorge Walk. Midmar Dam (23km): This well-known dam which also hosts the annual Midmar Mile is perfect for boating, fishing, sailing or just soaking up the sun! Karkloof (37km): A visit to the Karkloof Nature Reserve promises a mesmerizing experience considering the 80+ bird species flying overhead, and the 88m Karkloof waterfall crashing down from the cliff face. Bring a picnic or enjoy the braai facilities. 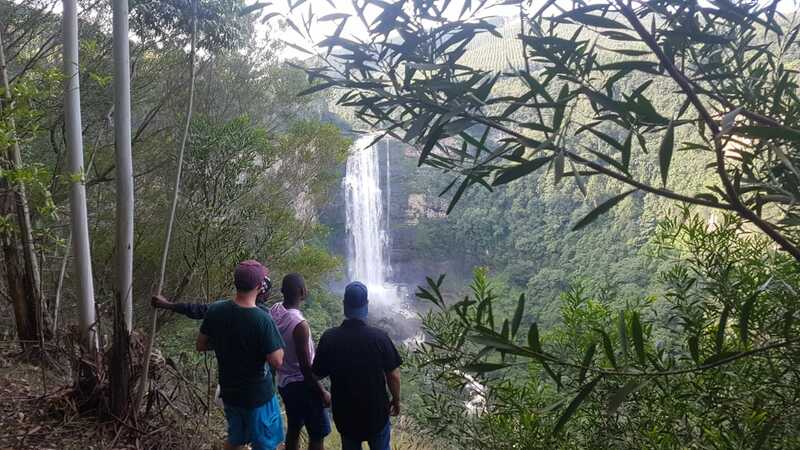 The AfriCamps team takes a break from construction and explores the surroundings at Karkloof Falls. 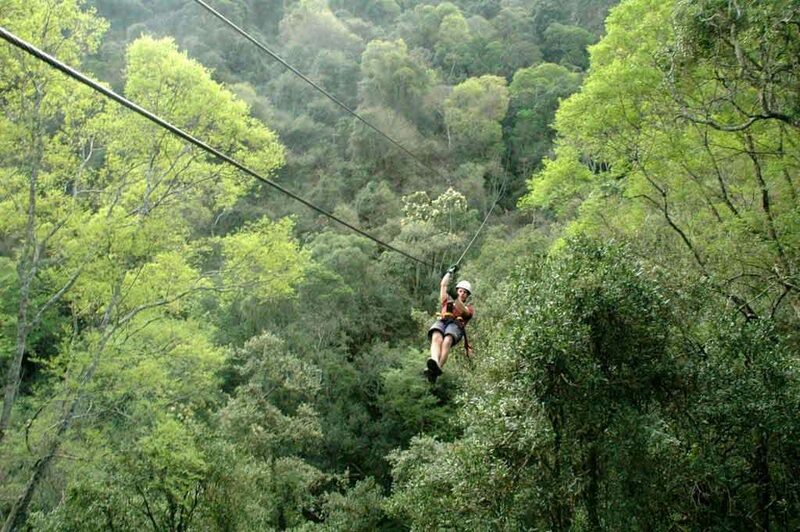 For the more adventurous, the Karkloof canopy tour is a must, or bring along your mountain bike for the beautiful trails. Drakensberg Mountains: The Drakensberg Escarpment stretches over 1000 kilometres, so you best do your research before simply ‘hiking the Drakensberg Mountains’. There are various sections, parks, and even provinces that form part of the Drakensberg Mountains. During your visit to the Midlands, you will be able to access parts of the Central and Southern Drakensberg. Not up for the drive? You can simply view ‘The Giant’ from the Nottingham Road turnoff. 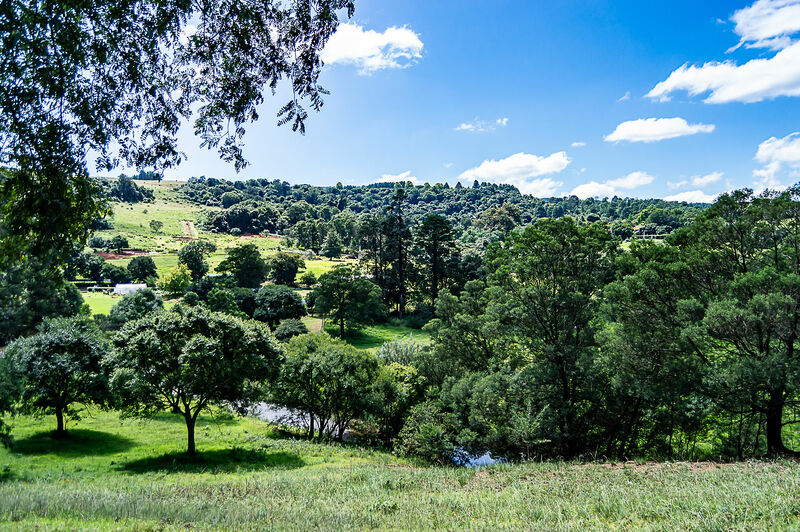 Highmoor Nature reserve (61km): This World heritage site in the Kamberg Valley forms part of the Mkhomzi Wilderness Area and takes you into the Southern Drakensberg mountains surrounded by grasslands and streams. Visit the reserve for hiking trails, fly fishing, rock art sightings. Maloti Drakensberg Park (53km): Beautiful day walks like the self-guided Giants Cup Hiking Trail and a wealth of rock art sites are must-sees. Fly fishing, rock-climbing, mountain biking, bird watching and swimming or some more options. 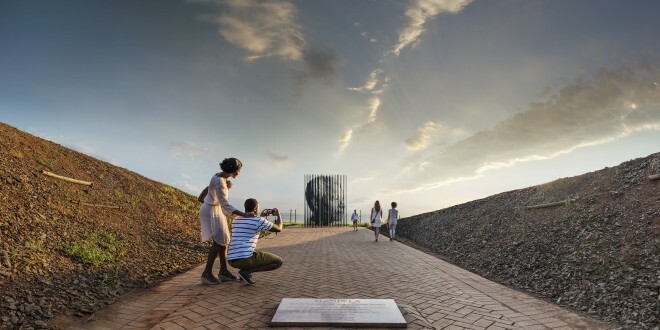 Nelson Mandela Capture site (15km): This famous Nelson Mandela Capture Site commemorates a significant moment in South African history with a visitor centre and a world-renowned sculpture. Nelson Mandela was arrested on 5 August 1962 outside of Howick. He spent the next 27 years of his life in prison. 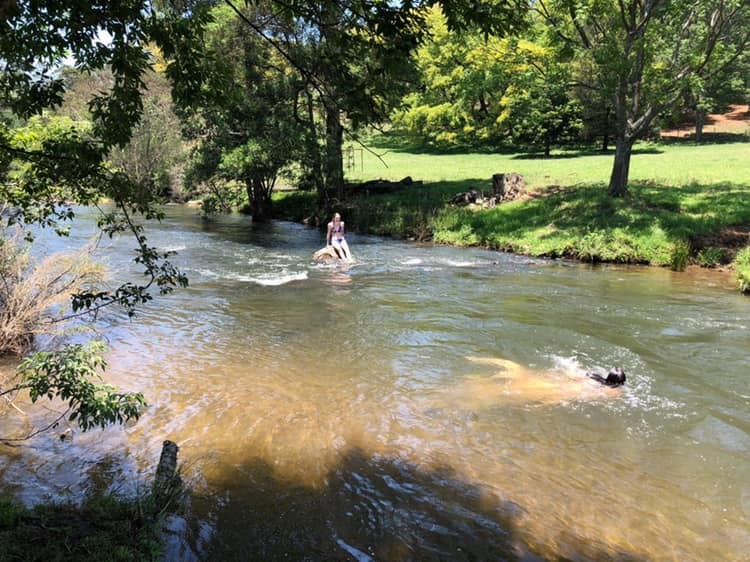 Midlands Meander Horse Trails (7.5km): A breathtaking horse trail winds through mountains, hills, dams, and pine trees in Lidgetton, a short 7.5 km drive away. Options include outrides, pony rides and even lessons. Piggly Wiggly (11km): A must-visit one-stop hub for food, activities and gifts the whole family will enjoy. In the centre of the Highgate Wine Estate enjoy wine tours and tastings in our beautiful family wine cellar. Indulge in breakfasts, light meals, lunches, pizzas, refreshments and, of course, a variety of lovely coffees and teas at the coffee shop. Candle dipping and the miniature steam train ride around the Piggly Wiggly will keep the kids busy on weekends. For the active ones, take part in the 5km Parkrun. Visit Meander Fine Wines for 700 wines from the Cape, Natal and around the world. The Pizza Place offers freshly made country pizza. The Greenery will give you your healthy juice fix along with bagels and salads. Stock up on meat from The Pantry and visit chocoholics can visit Chocolate Heaven for the chocolate dipping experience… or just to buy some delicious chocolates. A visit to Notties Junction (12km): Indulge in all the quirky finds while shopping at The Junction. 16 unique shops invite guests to grab a bite to eat, stretch their legs, or pick up some souvenirs.